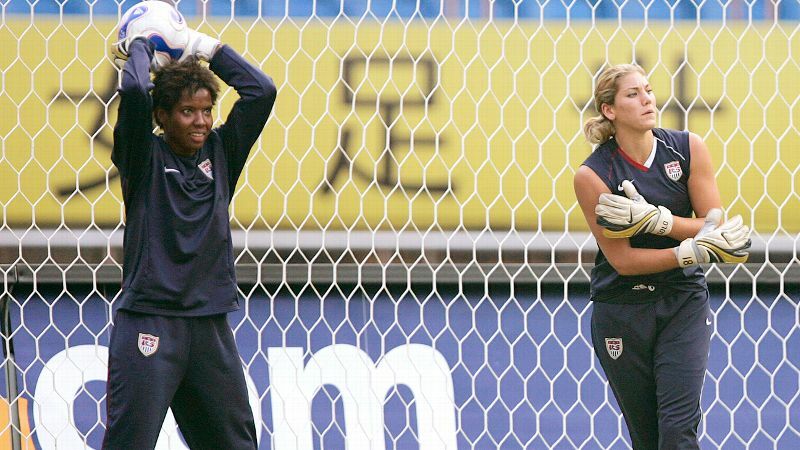 During the United States' last Women's World Cup victory in 1999, Briana Scurry played an integral role in the team's success. The legendary goalkeeper stopped nearly everything that came her way -- including a major shot during the penalty kicks of the final game to help secure the victory. Now retired from soccer, Scurry is cheering for her team from the comforts of home. I talked to Scurry by phone on Wednesday, the day after the U.S. advanced to the knockout stage, and we discussed everything from her prediction for the rest of the tournament, her advice for the U.S. team and her thoughts on former teammate (and sometimes adversary) Hope Solo. espnW: Having played such an important role for the U.S. women's team in so many major events, what is it like to watch the team as a spectator? Briana Scurry: I have really enjoyed it and just embraced it. I am rooting for the team. It's been really fun just to follow them and to watch the games and be a fan of the USA. It's interesting, because the team is just getting such great support with U.S. fans filling the stadiums. The team is through to the knockout round, which is definitely a good thing, and they're relatively healthy. espnW: What has impressed you most about the U.S. team so far? Scurry: I really think it's been an interesting World Cup. There have been a lot of very surprising results so far. For example, Cameroon somehow managed to get second place in its group, and no one had ever seen Cameroon and they had never even been in a World Cup! And Colombia beating France is amazing, too. And the reason I mention these, I think the results the U.S. has gotten with seven points and decent opportunities to score against teams playing fairly well, when you look at it in its totality that way, they're doing pretty well. There are a lot of teams that aren't getting the results you would expect, but the U.S. is -- that's how I look at it as a whole. And they won their group, which apparently has been kind of difficult in other groups. espnW: What do you think they need to improve on in order to win the tournament? Scurry: [Tuesday's] game was very, very interesting. For one, Alex Morgan started and played 65 minutes and, for someone who hasn't played much, she did a lot of things well. I really liked how focused she was and how she was running and her ability to do certain things. I also liked that she got in front of the goal quite a bit and had some opportunities to score and really opened things up. And Abby [Wambach] had a couple of opportunities as well, including the made goal. And the defense has been pretty solid throughout. So when you look at it in its totality, that team that played against Nigeria was the best that's played so far, and that bodes well. You want to be getting better as the tournament goes along, and they're definitely doing that. espnW: Do you think they will win it all? Scurry: I do. I think they have a chance at it. But here's the caveat with predictions like that: There comes a point in every game where a little luck is required, and you just don't know which way the luck is going to roll. Because the teams are so evenly matched when you get to the semifinals and the final, it a lot of time does depend on some luck -- a bounce of the ball, or a player tripping and another player not, or a headed ball cleared off the line. I mean, hello? I didn't forget that one! These things happen. So we can make these predictions but you just can't predict that luck. espnW: That's the beauty of soccer, right? Scurry: It is. It definitely is beautiful in that way. And cruel, depending on what side of the ball you're on. espnW: Who is the U.S.'s biggest threat for the title? Scurry: Based on the projected possible matchups, I know we're on the France-Germany side. The winner of that game, if they play each other first, would be the biggest threat for this side. Once we get to the final, assuming we get there, I think Brazil will be there at the end. espnW: What do you think about the turf controversy? Scurry: I am not a fan of turf and have never been a fan of turf. As a goalkeeper, I have had a few major injuries, and they have all occurred on turf. I'm not saying they were caused because of the turf, although one of them definitely was. I hurt my knee and ended up having surgery because of how I landed on the turf, with my knee slightly bent, and because the turf doesn't give, all the force of the turf went into my leg. So, you know, I'm clearly not a fan. In terms of watching the games, I've noticed a couple of things. No. 1 is the heat. From what I'm hearing, that turf is radiating the heat like crazy. It's a 15 or 20 degree difference between sun and shade on the same field. That's just insane. That factor causes a bit of sluggishness, but also the way the ball bounces. It just runs right out of bounds. I do think the teams are adjusting, finally, because they're starting to make more diagonal lines, which helps. But at the end of the day, everyone is playing on it and everyone has the same issues. Some teams just deal with it better than others. This will hopefully be the last time we ever see turf at this level. I hope we never have this issue again. espnW: Speaking of controversy, Hope Solo's presence on the field has certainly been a polarizing one. Do you think she should be playing? Scurry: I think the situation with Hope really highlights U.S. soccer's need to have a concrete policy surrounding domestic violence that needs to apply to all players. That's just really how I feel about that whole thing. espnW: How do you think the team should have handled everything with her? Scurry: I think U.S. soccer needs to have something in place to deal with this, and I'm not sure they had that initially. espnW: Do you think she's a distraction for her teammates? Scurry: What happens off the pitch has to remain outside the lines. I think what they need to do now is focus on the game, and I think that's what they're doing at this point. That's all they really can do at this time. espnW: Do you have any relationship with Hope at this point? espnW: Will you be attending any World Cup games in person? Scurry: Yes! I'm going to the final in Vancouver, I'm really excited about that. I'm going to do a little bit of work and a little bit of play. It's going to wonderful -- I'm going to be a part-time fan and a part-time analyst. espnW: What advice would you give to the team going into the next round? Scurry: My advice for the knockout round is simple: One game at a time, and survive and advance. That's it. When it comes to the World Cup and other major tournaments like this, winning is the only thing that matters. However you have to do it, that's how you do it. It doesn't have to look pretty, there are not style points in soccer and no one will remember how you looked on the pitch against whoever if you lose the game. One game at a time, one moment at a time and nothing else. You can't think about how you might play later in the next round because it's not relevant, you could be on the couch later watching that game if you don't focus on the right now.